Don Cherry is a legend. As many of our readers know, I have been quick to defend him in the past when people would go crazy over every little thing. We’re too politically correct in this day and age and if people can’t put up with hurt feelings because of someone’s opinion then we have gone entirely too soft in North America. However, I’m not here to defend Grapes today. In the past I have been hesitant to mention the on-again off-again obsession with Don Cherry’s often controversial comments. However, Cherry was wrong this time. Cherry was wrong on more than one key point on the night on the March 3rd edition of Coach’s Corner. During Cherry’s tirade, he attacked Toronto Maple Leafs GM Brian Burke and the Leafs organization for well, having too many Americans. The comments about the amount of American players on the team were a bit ludicrous. 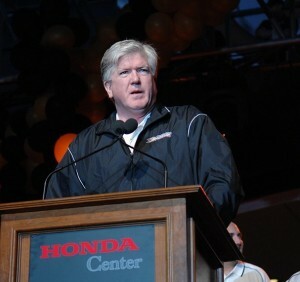 Many writers pointed out the hypocrisy of Cherry since he previously criticized the Montreal Canadiens organization for only hiring Francophone coaches. This is the exact same problem we have in North America today. People are getting hired based on reasons other than knowledge or qualifications. No one is entitled to a thing in this world. Everything is earned through hard work. Cherry is fueling the fire by insinuating that the feel good hometown stories should be drafted or signed instead of the best player available. When drafting a player, talent needs to be evaluated and ranked. When your position comes, you draft the best available player, whether he’s Canadian, American, Russian, Czech, etc. I also know that Brian Burke doesn’t care if players are American or Canadian. Burke only wants to win. If the Maple Leafs were picking first in the 1988 NHL Entry Draft would they have picked Darrin Shannon over Mike Modano? Using Cherry’s logic, that’s what they should have done since he was the first “Ontario Boy” to get selected that year. If Cherry wanted to attack Brian Burke, he could have attacked him for the fact that the team has seen little improvement in his tenure as general manager. He could have attacked him for poor player development since he took over in 2008. He could have attacked him for blaming Ron Wilson for the Leafs demise without sharing much of the responsibility. But he didn’t. Cherry could have had a legitimate case against Burke if he had gone about it the right way. But he played the nationality card, which never works anymore. The fans have moved on from that mindset. Another point it looks like Cherry might get more into next week is the story that broke earlier in the week regarding a group in Saskatoon (population 250,0000) being interested in bringing an NHL franchise to the city. Cherry briefly stated his belief that the NHL leaked this story. Unless I’m missing a major point here, I don’t see what the point would be for the NHL to leak this. Without getting into Saskatoon’s lack of population and corporate support, I don’t see the NHL using a town like Saskatoon as leverage against Glendale or any potential buyers there. So I’d be curious as to why Cherry thinks the NHL wanted that out there. I’ll have to wait to comment on that one. I like Don Cherry and have met him a few times and he’s always been a very interesting man to talk to and a kind and courteous guy in person. However, he got this one wrong. Remember this in the future before you get up in arms and want to sue him or throw him off the air. Cherry is paid to do what he did. He’s paid to give his opinion and grab your attention. No one said you always have to agree. This time, most of us didn’t.